Red Grace media has published Unpopular The Movie, and it’s wonderful. This half hour movie is Christ-centric, accurate, clear, and presents the Gospel in a devastatingly biblical way. When you hear/read the Gospel, unvarnished and with open ears and open eyes, it singes the heart and devastates the soul. It is incendiary. Even as a long-saved person, it will try your emotions, and bring you low. We ALL need The Gospel. We live in a culture that glorifies sin. That trivializes sin, that makes sin less heinous than it is. It is very deceptive to look at sin in a way that makes sense to us. If we see ourselves in the way that the culture tells us to see ourselves, then man can remedy his condition through technique. But if we see ourselves the way the Bible tells us we really are, then the only remedy for our sin is the work of the Savior. This is good. Watch it! Sin, repentance, the cross…are the most upsetting and controversial doctrines on the entire earth. They are presented here, along with God’s love and mercy. Listen and watch for yourself. We all need the Gospel, all the time. Let its truth and the majesty of a holy and righteous God who accepts sinners into His family through His slain and resurrected Son, Jesus. Then share. This entry was posted in Evangelism, Media, Ministry, Video on February 20, 2017 by Truth2Freedom. AT A CANDLELIGHT DINNER on the portico of Mount Vernon, Roman Catholic ethicist Michael Novak was reluctantly persuaded by the Mount Vernon Ladies Association to write a book about George Washington’s religious beliefs. Among the over one million visitors each year to Washington’s exquisitely preserved estate, the request for such a book is common but largely unrequited, Novak was told. This insistence on a religiously ambivalent Washington stretches back over many decades. Even Douglas Southall Freeman’s magisterial seven-volume biography dared not assert that its subject was overly devout. A serious Baptist and conservative Richmond newspaper editor, Freeman presumably did not share the secular biases of more recent biographers but nonetheless was cryptic and cautious about Washington’s religion. Henry Cabot Lodge, well over a century ago, was probably the last major biographer to insist that Washington was unequivocally a Christian, based on a single reference to Jesus Christ as “the Divine Author of our religion.” Either Washington actually believed this or he was a “liar,” Lodge wrote. The assumption of the last century’s scholarship that Washington was irreligious is partly his fault. Reserved and emotionally reticent, he left no extant theological treatises on his personal religious beliefs. The clues must be extracted from Washington’s ecclesial habits, his family life, his character, and the numerous references to the Almighty in his public writings and personal letters. WASHINGTON’S GOD by Michael and Jana Novak attempts to clarify the record about the great man’s religion. Such clarification is long overdue. The Novaks (who are father and daughter) remind us that for a century after Washington’s death, historians, starting with his first biographer John Marshall, described the first president as a devout Christian. The enormously successful hagiographer Parson Mason Locke Weems is routinely credited for generating pious myths about Washington. But the Novaks assert that Weems, who briefly pastored the Pohick Anglican Church that the Washingtons attended, was only disseminating what was already widely believed to be true. Most of Washington’s family, friends, and associates assumed he had at least conventional if not necessarily expressive Christian faith. “He took these things [religion] as he found them existing, and was constant in his observance of worship according to the received forms of the Episcopal Church in which he was brought up,” James Madison matter-of-factly observed of his fellow Virginian. The Novaks describe 18th-century Tidewater Virginia Anglican culture, in which gentlemen were expected to be church-going but reticent about their faith. “Lukewarm Anglican” then as now was a redundancy, they affirm. Prizing refinement over enthusiasm, even devout Anglicans were and largely still are expected to be tight-lipped and even inarticulate about religion. Washington was indeed tight-lipped about the specifics of his theology. But he was surprisingly frequent is his references to the Deity. His God was not remote or impersonal. Washington’s God, as he described Him in his public declarations and personal letters, was quite active and quite personal. This deity saved the young Washington several times from French and Indian bullets, saved Washington’s army from near destruction by the far larger British army, and saved the young republic from chaos and division. Washington’s few specific references to Jesus Christ and his lack of Trinitarian language helped fuel the assumption that he was a deist. The Novaks devote a whole chapter to deism, which they explain as a rationalization of Christianity. The deist God is a creator whose world is governed by natural laws and who desires moral living by humanity, whose conduct will be judged in the afterlife. Much of early Protestantism initially rejected Catholicism’s use of human reason, choosing instead to focus on faith alone. Deism, the Novaks suggest, allowed Protestants to incorporate the language of reason during the Enlightenment. Some deists remained Christians, while others would follow the European model of strict rationalism. Washington, as he related the many interventions of his God, clearly believed in a continuously active deity who was more than the detached “clockmaker” of strict deism. The language of Enlightenment, 18th-century Christianity, especially as employed by refined Tidewater Anglicans, was considerably less flamboyant than what would replace it. During Washington’s final years, the established Anglican and Congregationalist churches of the East Coast were losing market share to revivalist evangelicals. Methodists, and Baptists, with their emphasis on conversion and transformation, would dominate 19th-century America. Their christo-centric language was far more explicit about salvation, Jesus Christ, the Holy Spirit, and the demand for repentance. Early fans of Washington, in the wake of his death at the 18th-century’s close, sought to explain the first president’s Christian faith in the language of the new evangelical era. Washington’s own words frequently could not match these demands. So the hagiographers focused on Washington’s self-denial, his courtesy, his reliable church-going, his prayer life, and his ardent sense of duty and providential destiny. Exaggeration of Washington’s faith and character throughout the 19th century was inevitable. But the 20th-century backlash by increasingly secular historians also went too far. Modern biographers portray Washington as a Roman stoic who performed his religious duties perfunctorily to satisfy the public. The Novaks emphasize that whatever the specifics of the man’s personal faith, he said the same things about God in private as he did in public. He contrasts with Jefferson and Franklin and even Adams, who privately expressed doubts about orthodox understandings of Christ’s deity and the Trinity, even as they attended churches and affirmed Christianity. NONE OF WASHINGTON’S WRITINGS express any doubts about orthodox Christianity. If he had them, he left them unrecorded or confined to his correspondence with his wife, who burned nearly all their letters on his instructions. Martha was herself indisputably devout in her Christian faith, though she too left few written theological thoughts, in typical Anglican style of the time. The Washingtons usually attended Pohick Church near Mount Vernon and sometimes Christ Church in Alexandria. Either trip by carriage involved a couple hours of travel round trip. Washington financially supported both churches and gave considerable personal time over the decades to his work on the church vestry. Throughout his presidency he regularly attended churches in New York and Philadelphia. A few clergy over the years expressed concern that Washington rarely if ever took communion, even though Martha usually did. The Novaks write that this was not unusual for the time, and that the Eucharist was infrequently celebrated in churches of the era, even Roman Catholic ones. Although not noted by the Novaks, 19th-century biographers often disputed claims that Washington never took the Eucharist. Ostensibly, the nearly 100-year-old widow of Alexander Hamilton testified to her clear recollection of kneeling at the communion rail with the president. Washington’s spiritual life within his family appears to have been conventionally orthodox. He prayed before meals, read sermons out loud to Martha, and bought devotional material for his stepchildren. When stepdaughter Patsy was dying, he prayed audibly while on his knees at her bedside. Washington’s death, as described by secretary Tobias Lear, occurred relatively quickly, painfully, and touchingly for the servants, doctors, and family who tearfully looked on. The absence of clergy during those final hours, and the fact that Lear never ascribed any specific statements of faith to Washington, have reinforced the notion of him as a deist/stoic. The death at Mount Vernon contrasted with Alexander Hamilton’s several years later. Shot in a duel, the flamboyant former aid to Washington dramatically requested the presence of an Anglican bishop and demanded the Eucharist while professing his faith in Christ. Washington was a different character, and he died as he lived, with understatement and composure. Martha prayed with her Bible at the bedside while Washington uttered his final words: “Tis well.” Martha responded with the same phrase. “It was a noble death and quite Christian in its entire content,” the Novaks write. The Novaks also observe that Washington’s taciturnity about religious specifics throughout his life, as on many other issues, allowed him to serve as the indispensable man in whom people of all faiths placed their trust. Washington’s public utterances about God were unifying rather than divisive and were admired by Anglicans, Congregationalists, Presbyterians, Baptists, Methodists, Lutherans, Roman Catholics, and even Jews. He carefully wrote to their congregations, visited their places of worship, and received their delegations, commending their faith and urging their loyalty to the new republic and its promise of religious liberty to all. In religion, as in statecraft, Washington set the example that all other presidents would follow in some form. The Novaks insist, not without logic, that a Washington without serious faith could not have managed this so equitably and successfully. They are almost certainly correct. This entry was posted in Culture, Opinion/Commentary on February 20, 2017 by Truth2Freedom. February 22 marks President George Washington’s 285th birthday. Beloved as the Father of our country, the elements of Washington’s life captivate historians and spectators alike. Visitors can wander the gardens and grounds of his adored Mount Vernon home. Docuseries examine the Washington’s courtship and marriage. Biographies detail the Chief Founding Father’s exemplary military skills, judicious presidency, and morally upright character. Yet, with so much of Washington’s history preserved and at our fingertips, his religious beliefs are ever-debated. Many note the lifelong Anglican was indeed a sincere Christian. Others argue Washington was religiously ambivalent while some others say he was a Deist. That is, someone who acknowledges God exists but believes He is detached from the activities of mankind. This faith debate marches on, even as Washington’s own words and materials seem to substantiate a devout, albeit private, confidence in traditional Christian teachings. Happily I found biographer Peter Lillback’s George Washington’s Sacred Fire on my local library’s bookshelf. Lillback’s research authenticates Washington’s Christian piety by examining everything from the use of a 1662 edition of the Book of Common Prayer of the Anglican Church, his incorporation of the Scriptures in his writings, to copious handwritten letters and speeches. The evidence points to an astute leader nurturing religious freedom in a new nation, not rejecting his Savior. 21:1 Sovereignty of God. A king’s decisions are controlled by God. The verse uses synthetic parallelism to develop the point. The first line affirms that the decisions (“heart”) of the king are under the Lord’s control (“in the hand”), and the second explains that God directs the king as he pleases. 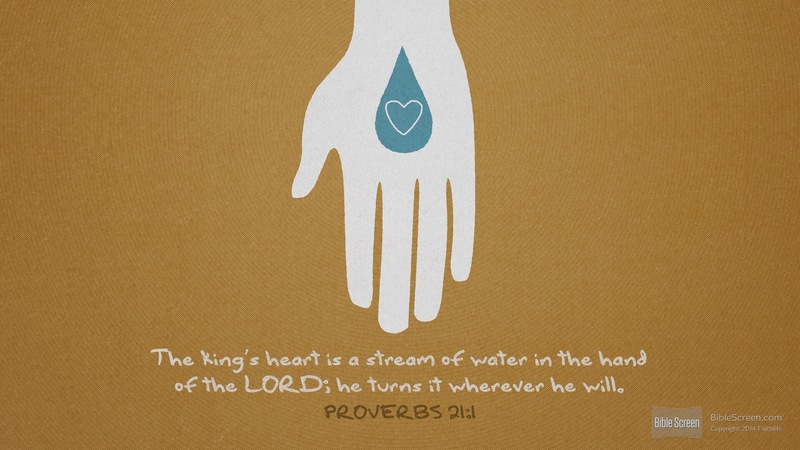 What clarifies the second line is the simile that the heart is “like a watercourse.” As a farmer channels the water where he wants and regulates its flow, so does the Lord with the king. No human ruler is supreme; to put it another way, the Lord is truly the King of kings. Scripture offers many examples of the truth of this proverb (Ezr 7:21; Isa 10:6–7; 41:2–4; Da 2:21; Jn 19:11). 21:1 He turns it. See notes on 16:1, 9, 33; cf. 19:21; 20:24. Note the examples of the divine hand of God in the cases of Artaxerxes (Ezr 7:21–23), Tiglath-pileser (Is 10:5–7), Cyrus (Is 45:1–4), and Nebuchadnezzar (Da 4:34) and Belshazzar (Da 5:23–25). 21:1 The stream of water describes water flowing through a channel or an irrigation ditch, which a skillful farmer can turn to flow wherever he wishes. 21:1 in the hand of Yahweh Even though kings hold great power (Prov 14:28; 16:15; 20:2), they are ultimately under the jurisdiction of God’s power over the entire earth. 21:1 The king’s heart … Lord. Possibly a reference to the sovereignty of God even over pagan kings who unwittingly do His will (e.g., Cyrus in Is. 45:1), or to the king of Israel, who, like Solomon, received a special endowment of the wisdom of God (16:10 and note). 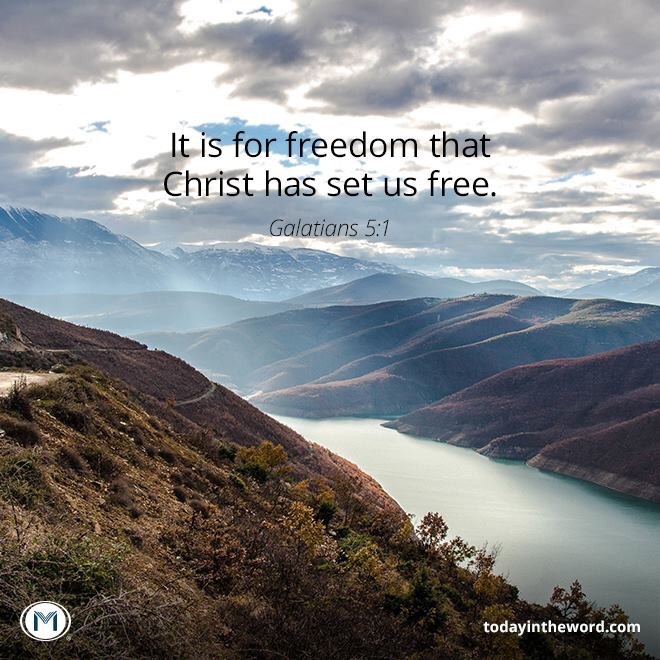 This entry was posted in Daily Devotional Guide, Verse of the day on February 20, 2017 by Truth2Freedom. Walk worthy of the Lord, fully pleasing Him, being fruitful in every good work. What kind of fruit brings glory to God? Philippians 1:11 says, “Being filled with the fruits of righteousness which are by Jesus Christ, to the glory and praise of God.” Righteousness, which is doing right, is the fruit God desires in our lives. When we do right, we glorify God; when we do wrong, we dishonor Him. Fruit is synonymous with righteousness. How do you get the right attitudes? Verse 25 says, “If we live in the Spirit, let us also walk in the Spirit.” As you yield control of your life to the Holy Spirit, He will permeate your life and produce the proper fruit. God will lavish grace upon sinners who are truly repentant. Did you ever sin so terribly that you felt, I really blew it this time. There’s no way God would want to forgive me now? It’s easy sometimes to let our past sins be a constant burden to us, even after we’ve confessed and repented. Paul has comfort for those who feel this way, and that comfort is founded on the power and measure of God’s grace to us. Before his conversion, Paul (then known as Saul) persecuted the church mercilessly (see Acts 8:3 and 9:1–2). He was “a blasphemer and a persecutor and a violent aggressor” (1 Tim. 1:13; see also Gal. 1:13). If anyone could be beyond grace, it was Paul. But God intervened and saved him (Acts 9:3–19). Why? 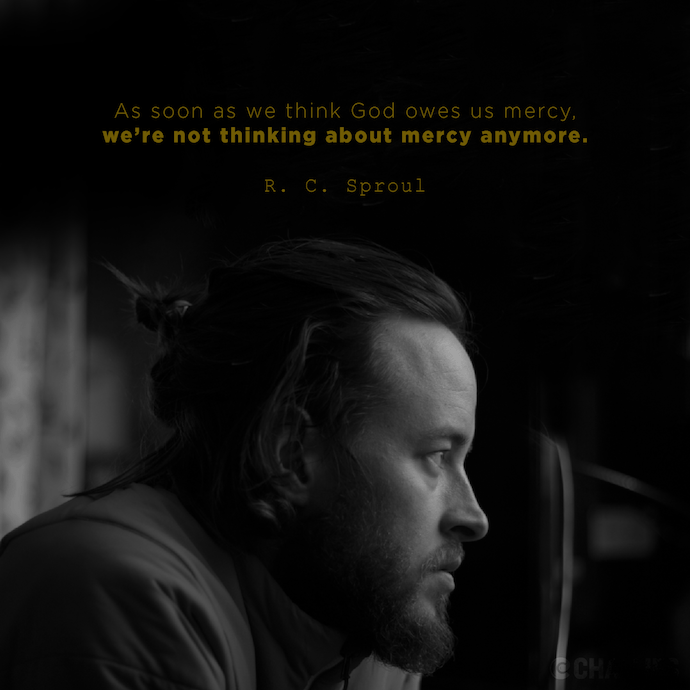 “For this reason,” Paul says, “I found mercy, in order that in me as the foremost [sinner], Jesus Christ might demonstrate His perfect patience, as an example for those who would believe in Him for eternal life” (1 Tim. 1:16). If God would forgive Paul, He will forgive anyone who will confess their sins and repent. If He would show abundant grace to a violent unbeliever, He will also shower grace upon His penitent children. God is not stingy with grace. Paul celebrates God’s saving “grace, which He freely bestowed on us” (Eph 1:6), and “the riches of His grace, which He lavished upon us” (vv. 7–8). Speaking of sustaining grace, Paul says, “God is able to make all grace abound to you, that always having all sufficiency in everything, you may have an abundance for every good deed” (2 Cor. 9:8). Notice the words Paul uses: “all grace,” “abound,” “all sufficiency,” “everything,” “abundance,” “every good deed.” God’s grace is inexhaustible and is given so freely that words cannot express it fully. Great sins require great grace, but God will give super–abundant grace to those who seek forgiveness, for “where sin increased, grace abounded all the more” (Rom. 5:20). Don’t let your past sins weigh you down; learn to rest upon God’s super–abundant grace. Suggestions for Prayer: Ask God to teach you to understand His grace more fully and help you forget “what lies behind” (Phil. 3:13). For Further Study: Read Romans 6. What is Paul’s argument here? ✧ How are we to live now that we have received God’s grace? It is hardly a matter of wonder that the country that gave the world instant tea and instant coffee should be the one to give it instant Christianity…. And it cannot be denied that it was American Fundamentalism that brought instant Christianity to the gospel churches…. Instant Christianity tends to make the faith act terminal and so smothers the desire for spiritual advance. It fails to understand the true nature of the Christian life, which is not static but dynamic and expanding. It overlooks the fact that a new Christian is a living organism as certainly as a new baby is, and must have nourishment and exercise to assure normal growth. It does not consider that the act of faith in Christ sets up a personal relationship between two intelligent moral beings, God and the reconciled man, and no single encounter between God and a creature made in His image could ever be sufficient to establish an intimate friendship between them…. We talked yesterday about two specific sins that hinder biblical mourning. Let’s consider two others today. The sin of presumption is actually a form of pride. Presumption is satisfied with cheap grace and expects God to forgive just a little bit because it sees so little to be forgiven. It leads us to think our sins are not really bad enough for us to confess them, repent of them, and forsake them. But Isaiah exhorts sinners as follows: “Let the wicked forsake his way and the unrighteous man his thoughts; and let him return to the Lord, and He will have compassion on him, and to our God, for He will abundantly pardon” (Isa. 55:7). The kind of gospel (so popular today) that omits any need for repentance and mourning is a false, unscriptural gospel—or as Paul calls it, “a different gospel” (Gal. 1:6). Procrastination, as the term suggests, hinders true mourning simply by putting it off. We tend to think when things are better and the time is more convenient, we will ask God to cleanse and forgive our sins. But that is foolish and risky because “you do not know what your life will be like tomorrow. You are just a vapor that appears for a little while and then vanishes away” (James 4:14). If we do not deal with sin sooner rather than later, we can’t be sure God’s comfort will ever come. The best and surest way to eliminate hindrances to mourning is to look, through prayer and the Word, to the holiness of God and Christ’s great atoning sacrifice for sins. Unlike some of our sins, these tend to be more subtle and soft-pedaled. But sins of all kinds are capable of blinding us to our utter dependence on God and His forgiveness. Ask Him to reveal to you any hidden sins, wanting to bring to the surface everything that dishonors Him. There are many legal and governmental reasons why lost men and women should not go to heaven! It should not be difficult for us to acknowledge that a holy and righteous God must run His universe according to holy laws—and we do not belong there because we have broken every one of those holy laws in some way! Therefore, there must be an effective redemption, a justification of some kind if we are to have God and He is to have us! Thank God, it has been done! The New Testament language is as plain as can be—in Christ through His death and resurrection, every legal hindrance has been met and satisfied: taken away! There is nothing that can keep us from assurance except our own selves. Let us quit trying to think our way in, to reason our way in. The only way to get in is to believe Him with our hearts forevermore! Yes, Lord, thank You so much for providing an “effective redemption” so that we may have unbroken fellowship with You—both now and for all eternity. Praise Your holy and righteous name! “… so that you may approve the things that are excellent” (Phil. 1:10). In a world of mediocrity and confusion, God calls you to excellence and discernment. There’s the story of a pilot who came on the loudspeaker midflight and said, “I have some good news and some bad news. The bad news is, we’ve lost all our instrumentation and don’t know where we are. The good news is, we have a strong tailwind and are making great time.” That’s an accurate picture of how many people live: they have no direction in life, but they’re getting there fast! We as Christians are to be different because we have divine guidance and eternal goals. Our lives are to be marked by a confident trust in God and a pursuit of spiritual excellence. “Excellent” in Philippians 1:10 speaks of things that are worthwhile and vital. “Approv[ing]” what is “excellent” refers to testing things as one would test a precious metal to determine its purity and value. It goes beyond knowing good from evil. It distinguishes between better and best. It involves thinking Biblically and focusing your time and energy on what really counts. It involves cultivating spiritual discipline and not being controlled by your emotions, whims, moods, or circumstances. Many organizations and businesses have rightly adopted the motto “Commitment to Excellence” to convey their desire to provide the finest product or service possible. If secular-minded people strive for that level of achievement, how much more should Christians pursue excellence for the glory of God! Look at your life. Is it filled with godly love, discernment, and the pursuit of excellence—or has worldly trivia crowded out those virtues? Suggestions for Prayer: Read Isaiah 12:1–6 as a psalm of praise to the God of excellence. ✧ Ask God to give you a heart constantly set on pursuing excellence for His glory. For Further Study: Daniel was a man who pursued excellence. Read Daniel 1:1–2:23. ✧ What was Daniel’s decision regarding the king’s food and wine, and how did he handle the situation? ✧ How did Daniel and his three friends compare in wisdom and understanding to the magicians and conjurers? ✧ What principles do you see in those two chapters that apply to your life? No chastening for the present seemeth to be joyous, but grievous: nevertheless afterward it yieldeth the peaceable fruit of righteousness…. To do His supreme work of grace within you He will take from your heart everything you love most. Every thing you trust in will go from you. Piles of ashes will lie where your most precious treasures used to be. Thus you will learn what faith is; you will find out the hard way, but the only way open to you, that true faith lies in the will, that the joy unspeakable of which the apostle speaks is not itself faith but a slow-ripening fruit of faith. You will learn, too, that present spiritual joys may come and go as they will without altering your spiritual status or in any way affecting your position as a true child of the heavenly Father. Then you will also learn, probably to your astonishment, that it is possible to live in all good conscience before God and men and still feel nothing of the “peace and joy” you hear talked about so much by immature Christians! MacArthur, J. (2001). Truth for today : a daily touch of God’s grace (p. 63). Nashville, Tenn.: J. Countryman. MacArthur, J. (2008). Daily readings from the life of Christ (p. 59). Chicago: Moody Publishers. MacArthur, J. F., Jr. (1993). Drawing Near—Daily Readings for a Deeper Faith (p. 63). Wheaton, IL: Crossway Books. This entry was posted in Daily Devotional Guide on February 20, 2017 by Truth2Freedom.